Home / Dave Shaw wins NZL 2018 Nationals. 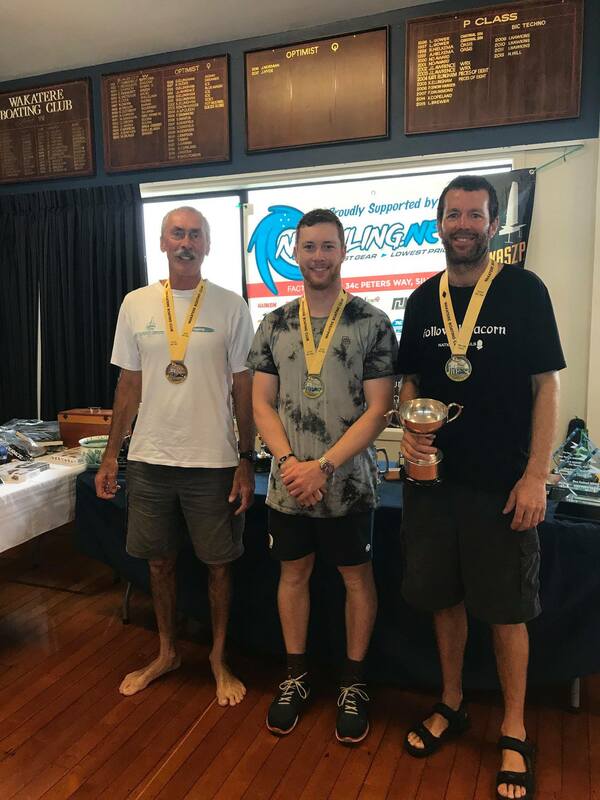 Dave Shaw wins NZL 2018 Nationals. 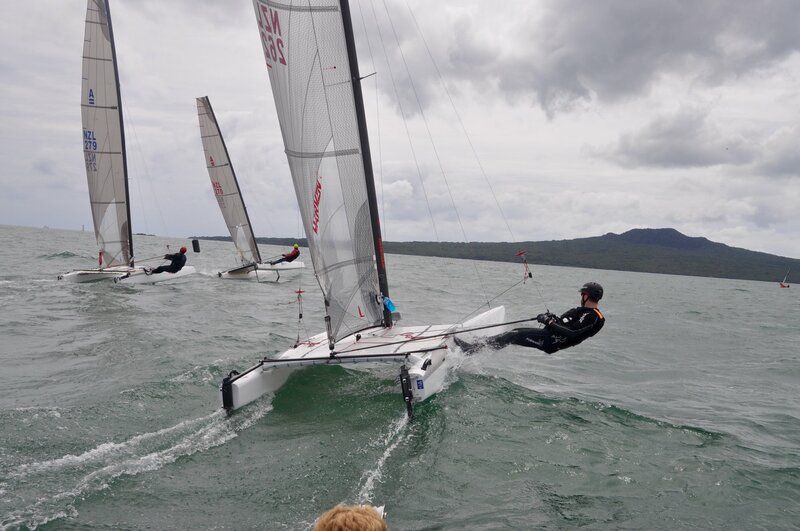 2018 New Zealand National Championships. 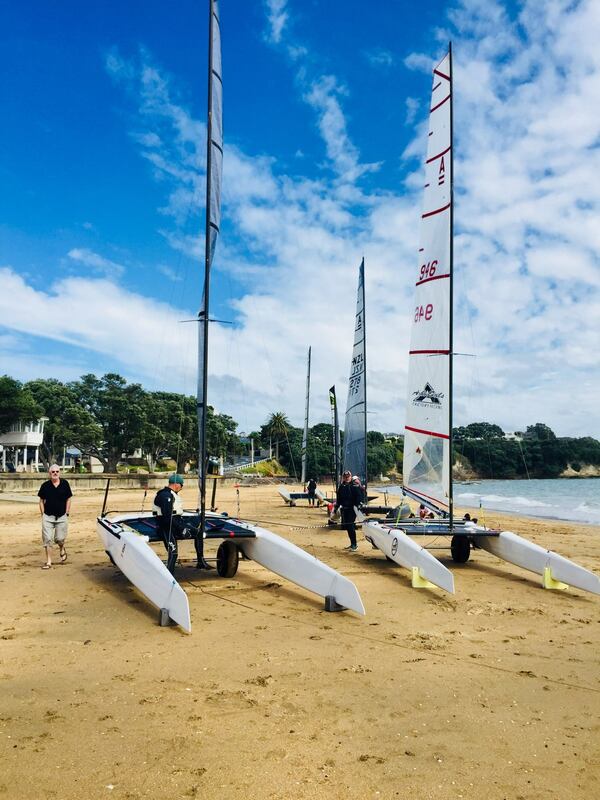 Held at Wakatere Boating Club, Narrow Neck Beach, 8th - 11th February, 12 scheduled races, 10 sailed. Dave Haylock reports. Day 1 - The whole regatta had strong winds predicted with likely the worst to be seen on day one. The fleet numbers were down to 13 this year, some put off by the forecast and a few racing in other classes that weekend. The fleet launched into a nice SE breeze coming down the channel between the North Shore and Rangitoto Island. Race 1 was held in building breeze, by the end of the race gusting around 20 knots with large waves at the top of the course. By the end of this race, many of the fleet had either pulled out due to the conditions or damage. Race 2 started with just 3 boats and was run without incident. Race 3 saw another boat retire beforehand and 3 more boats head out to join to give 5 boats on the start line. At the line it was 18 gusting 22 and the top of the course had a lot more. After the start 2 boats pulled out, one broken mainsheet and one not keen on conditions. 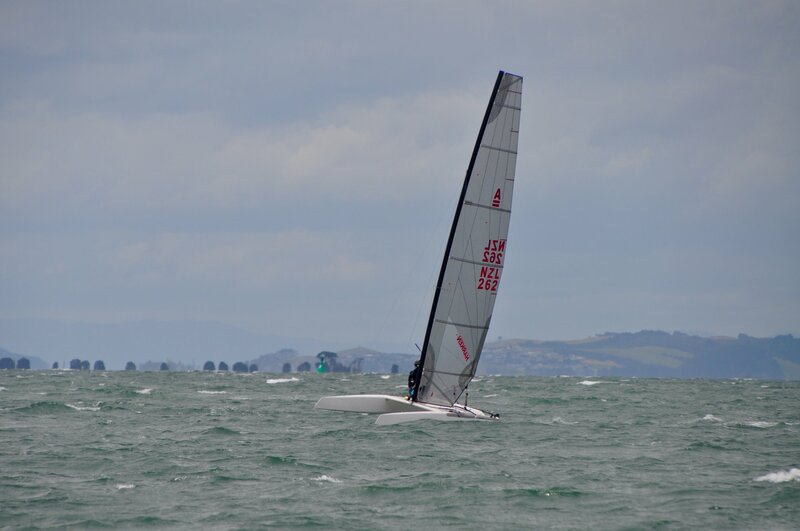 At the last top mark rounding, regatta leader Dave Shaw broke his mast in a capsize and his boat turtled. This race was finished in a close fought run that ended with a boat doing a 360 and breaking a rudder while Harry Bailey, our youngest competitor at 15 years took the win. It was fair to say that day one was a tough one and had taken its toll on some on the boats. Day 2 - A much more favourable breeze greeted the fleet on day 2 and all boats were back out for racing. This was also the start of the Waszp, OK and 3.7 nationals held at the same time. The Waszps were running on the same course as the A-Class with a shorted course. The breeze built again during the day with the final race being about 18knots. Race 5 and 6 had OCS boats with everyone pushing the start. 2 boats retire for the last race of the day and 3 didn’t finish it. 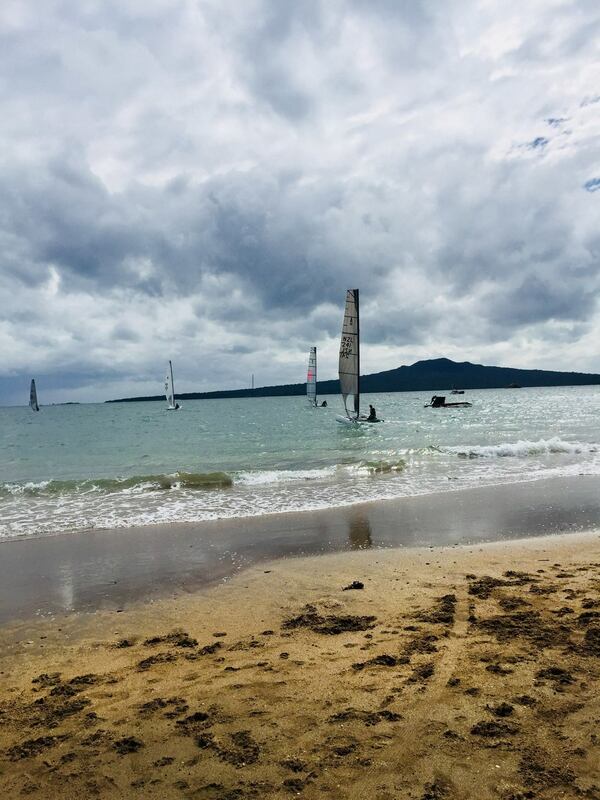 Day 3 - This promised to be the lightest breeze of the regatta, the wind had moved around to the east with Rangitoto providing good protecting and keeping seas relatively flat. Dave Shaw took off in the first race as the only one that was able to foil down the first run, however by the 3rd lap he was 3rd around the top mark, then going on to win with another foiling run. The wind was shifty and gusty which provided some interesting racing and lots of position changes throughout the fleet. Day 4 - The final day of the regatta saw a strong breeze first up and heavy rain. There were discussions in the fleet around not sailing the last day and a couple of boats had started to pack up, not keen on the conditions. It was decided a group would rig and go onto the beach, all knowing that once the boats got to the beach there would be no turning back for a couple of them. The breeze had swung a little to the north and Rangitoto wasn’t providing the same protection. Large waves were breaking onto the beach making launching tough. All eyes were on the conditions with wind readings from around the Gulf ranging from 20 gusting 25 to 30 gusting 40. We had about 18 - 20 on the race course. With the fleet launched we had 9 boats for the final day on the water. The first race got away and in moved the rain, you couldn’t see the top mark from the bottom and the lay lines were tough to pick. All fleets had one race in before AP over A was flown and the fleets were sent ashore. The race committee deciding it wasn’t safe to race when they couldn’t see the fleet. With the regatta over we all packed up in the pouring rain while the wind built and built. We were fairly happy to be ashore and to have tough but successful regatta completed. Well done to Dave Shaw and thank you to Wakatere for putting on such a great regatta.